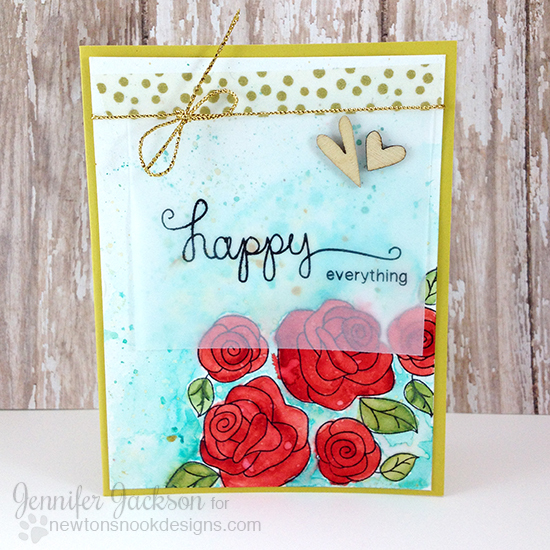 I had so much fun playing with watercolors and our Love Grows stamp set to create this card! I stamped several of the roses and leaves on a piece of watercolor paper using waterproof black ink. Then I used distress inks to color the roses and the teal background and splattered some ink over them to get the fun watercolored droplets! I love how this turned out. 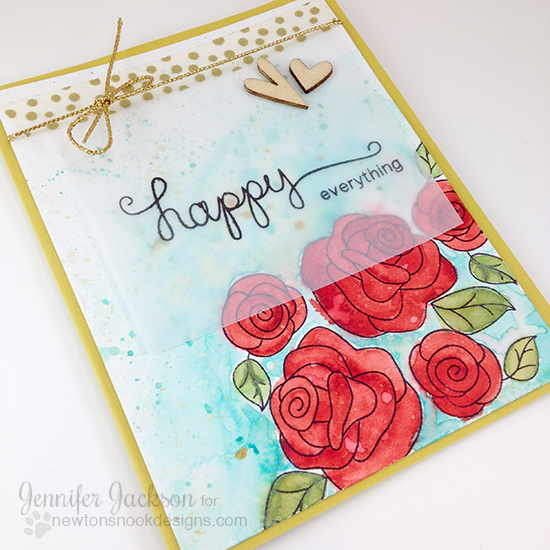 Then I stamped the "happy everything" sentiment using words from the Simply Sentimental stamp set on some Vellum. I added the vellum to the card with a piece of gold dotted washi tape (it's always so hard to figure out how to adhere vellum!). Then I added on some wooden heart embellishments and a piece of gold twine to finish it off and added it to the card base! I love how this card turned out - it's a nice "general" card to have on hand - I could use it for a birthday, anniversary, or even for a wedding card! Well done, Jennifer! Love the bright colors, great watercoloring and amazing layout! Super pretty! I just love this card, it's SO pretty! Great job! Your arrangement of roses is gorgeous, Jen! Impressive watercolouring!